The Futura Hard Anodised Handi (Saucepan) is a modern version of the traditional Indian cooking utensil used for flavourful, less-water cooking. Its lid holds water on the top and, on its underneath surface, condenses steam that rises from the food simering in the Handi. The reverse taper of the sloping sides of the Handi permits water droplets to fall directly on to the food inside the Handi - thus making delicious, tender and moist food. The Handi (Saucepan) comes in two versions: with one long and one short handle; and with two short handles. The One Litre Futura Hard Anodised Saucepan comes with a spout for pouring and is specially suitable for making tea or other beverages and boiling milk. 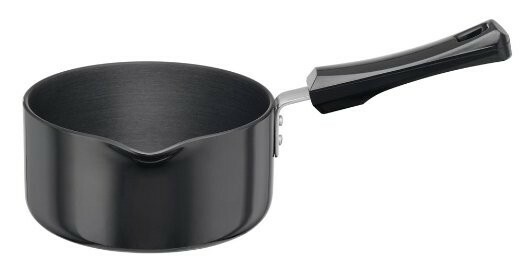 The larger capacity Saucepans have flared rims. All Saucepans either come with lid or are offered with an optional lid. The Saucepans have one long handle.